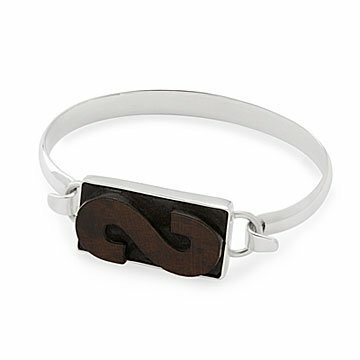 Look letter perfect with this bangle featuring a piece of vintage wood type. Look letter perfect with this bangle featuring a piece of vintage wood type. Retired from years of printing posters and broadsides, your choice of letter selected from sets of hardwood type is set in a sterling silver bezel mounted on a tension-style sterling silver bracelet. Each letter is lightly lacquered to protect its surface and showcase the embedded ink and imperfections that reflect its unique printing history. The bracelet makes a sweet birthday or Mother's Day gift, or a typographic treat for yourself. Due to the nature of letterpress printing, some letters will appear to be backwards. Designed by Ward Wallau; handmade in Mexico. Polish sterling silver with polishing cloth.